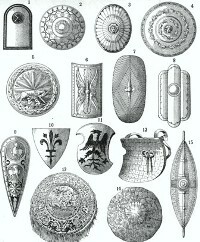 The above picture provides an overview of some different shield shapes. Shields became common use in all parts of the world including the Americas, Europe, the Middle East, Far East and the Orient. Shields shapes varied according to the type of battles of warfare that was to be fought and the materials and technology available. The shapes, sizes and weight of shields depended upon whether warriors or soldiers relied on speed and surprise or whether the enemies weapons had such force that highly protective and heavy shields were required. The shapes of the earliest shields were round, oblong or rectangular. The Romans saw the decline of round shields to rectangular or cylindrical shields, primarily the scutum. The Medieval Life and Times website provides interesting facts, history and information about the swords and armor used in the battles and warfare in the history of the times, including the Shield Shapes, which scatter the history books. The Medieval Times Sitemap provides full details of all of the information and facts about the fascinating subject of the lives of the soldiers and knights and their swords and armor who lived during the historical period of the Middle Ages. The content of this article on Shield Shapes provides free educational details, facts and information for reference and research for schools, colleges and homework for history courses and history coursework.